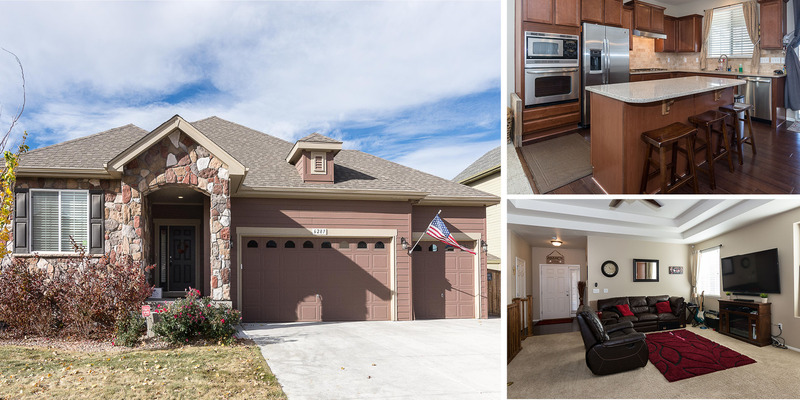 TONS OF ROOM IN THIS BEAUTIFUL RANCH, WITH 2659 FINISHED SQUARE FEET! 9′ CEILINGS ON MAIN FLOOR, BEAUTIFUL HARDWOOD PLANK FLOORING IN ENTRY, KITCHEN & EATING SPACE! LIVING ROOM BOASTS DOUBLE COVED CEILING W/ CEILING FAN! OPENS TO KITCHEN AND EATING SPACE! LIGHT, BRIGHT KITCHEN W/ QUARTZ COUNTERTOPS, ROCK BACKSPLASHES, 42″ CABINETS, LG PANTRY, SS APPLIANCES INCLUDING 5-BURNER GAS COOKTOP, OVEN, MICROWAVE, REFRIG & DW. EAT AT ISLAND!! SPACIOUS MASTER SUITE ON MAIN LEVEL WITH DBL COVED CEILING W/ CEILING FAN FEATURES 8X10 RETREAT WHERE YOU CAN RELAX AT THE END OF THE DAY, 2 WALK-IN CLOSETS & 5-PIECE BATH! MAIN FLOOR ALSO HOSTS SECONDARY BEDROOM, FULL BATH, AND POWDER ROOM. BSMT FINISH INCLUDES 15’X20′ BEDROOM, 3/4 BATH & 19’X21′ FAMILY ROOM! FENCED BK YD W/OUTDOOR GAS FPL, SPRINKLER, CUSTOM WINDOW COVERINGS. 3 CAR GARAGE. SMOKE FREE HOME HAS CENTRAL A/C AND IS CLOSE TO COMMUNITY CLUBHOUSE, POOL & TENNIS COURTS! View the full MLS information here.